With the Cavaliers out of the playoffs, the focus then turned to James’ impending free agency. 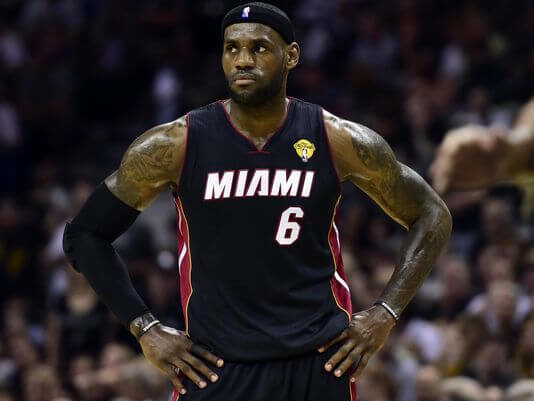 On July 8, 2010, James announced in a nationally televised one-hour special titled The Decision on ESPN that he would be signing with the Miami Heat. The repercussions of this announcement left many in the city of Cleveland infuriated and feeling betrayed. A number of LeBron James jerseys were burned, and the famous Nike “Witness” mural of James in downtown Cleveland was immediately taken down. Shortly after James made his announcement, Dan Gilbert, the owner of the Cavaliers, announced in an open letter on the Cavaliers website (since dubbed as “The Letter” by some) that James’ decision was a “cowardly betrayal” and promised an NBA championship for the Cleveland Cavaliers before LeBron James wins one, although James would win a championship before the Cavaliers with the Heat’s championship in 2012. Despite being ridiculed for the letter by the media, Cleveland fans embraced the owner, even offering to pay the $100,000 fine given by the NBA.